Add 40g caster sugar to the egg yolk, beat until pale, whisk in milk and oil, and fold in flour and cocoa powder. Split the egg white mixture into 3 parts, and then fold each part into the egg yolk mixture in turn. Pour the mixture into a greased pan and bake in a preheated oven, 170oC, for 35min, or until firm. Chill the bowl and whisk attachment of a stand mixer for 20 min. in the refrigerator or 5 min. in the freezer. Pour the heavy cream into the bowl and whisk on medium-high speed until it just starts to thicken. Slow the speed down to medium and gradually pour in the sugar. Continue to whisk until soft peaks form. Add the vanilla extract and continue to whisk by hand until the cream is smooth, and stiff peaks form (the cream will stand up straight when the whisk is raised). Sandwich the layers with the frosting and sliced fresh strawberries. Spread frosting across the top and cover the sides. Transfer some frosting in a piping bag and create some decorating patterns. 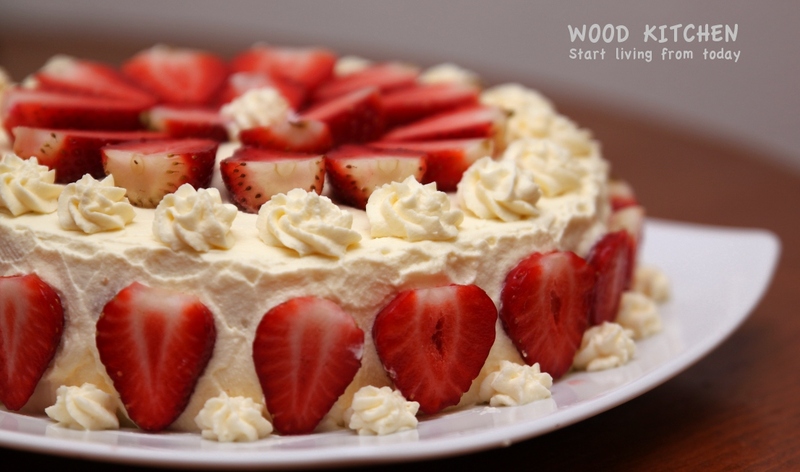 Neatly arrange sliced strawberries on top and side of the cake.